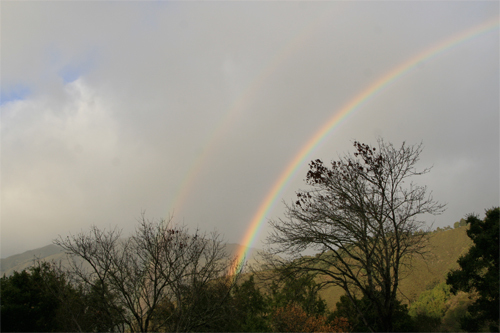 During the 2009-2010 rainy season the precipitation gauge at my home here in Big Sur received a total of 36.24” of rain, which was more than the totals for any of the previous three years. It was a particularly long rainy season, lasting from October 13, 2009 to May 28, 2010. Last week I checked up on some oaks in Santa Barbara that have been undergoing fire mimicry treatments for the past two years. One way I assess the change in health of a tree is through repeat photography analysis of the tree’s canopy. Repeat photography is not as simple as it seems. Photographs are taken at the time the oaks are first treated. Subsequent photos are taken at annual intervals, meaning I get to visit the trees I treat every year, year-after-year. It’s quite a commitment to schedule yearly visits to all the oaks I’ve treated. In re-photographing the trees it is important to match the time of year, time of day, sky condition, camera angle, and exposures as closely as possible to the original photos. I don’t get it precise every time, but I do my best. Changes in tree health can be detected in the photographs as increases or decreases in canopy density (the amount of background sky seen through the canopy), and in changes in the amount of gray or brown foliage vs. green foliage. Below are the results of the repeat photography analysis of the canopy health in the Santa Barbara oaks I visited last week . . .